Ethiopian – O Hei There! 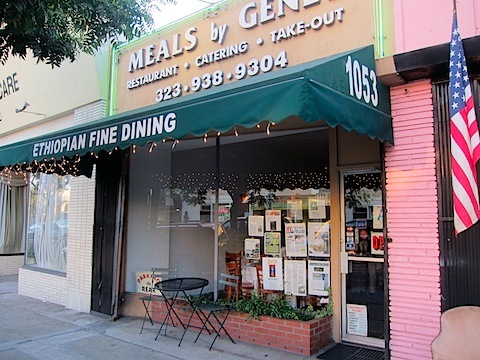 When I was in high school, I lived near Pico and Fairfax for a year. During that year, I frequented the Carl’s Jr. on Olympic and Fairfax on a regular basis. On my way back home after making myself fat, I would bypass the block on Fairfax that is Little Ethiopia. I ended up trying a couple of the Ethiopian restaurants on the block before I moved out of the area, but for the most part I disregarded them. Oh, young Chris Hei. A couple of Fridays ago, when deciding what to eat for dinner with Ben and Danno, I decided to choose something unconventional for the group. Ethiopian it is! Figured that a three-person group was perfect to share one of those huge platters of food that people might be familiar with regarding Ethiopian food. We got there a bit past our reservation time of 9pm (since street parking is really hard to find – had to park a few blocks away closer to Pico), and had to wait maybe 10-15 for our table. But no big deal, and the servers were more than courteous before and during our dinner. Each of our servers were very knowledgeable, and we were obviously not about the cuisine. So they suggested ordering a vegetarian combination, which had a salad and a bit of all of the side dishes, as well as a couple of their dishes. 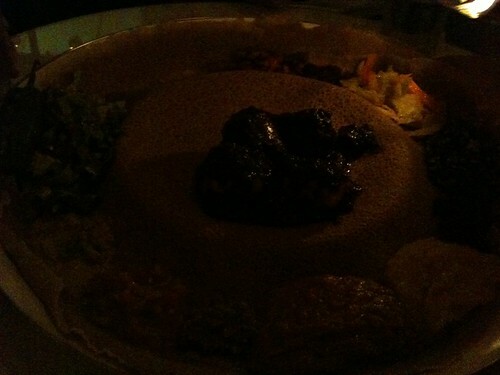 We chose the dorowot (what they’re famous for, and probably the most popular Ethiopian dish) and the kifto. The dorowot is chicken slow-cooked in a red pepper sauce (I think they said for 50+ hours), and also has some hard boiled eggs in it. The kifto is a steak tartare with Ethiopian butter. All of the items came out on one big platter (well, the kifto actually came out a bit after, but there was a designated space on the platter for it). All of the veggies were placed on the outer rim, while the dorowot sat in the middle. And everything was served on a big bed of injera, which is a sourdough-y, spongy flatbread that is used to scoop the food up in lieu of utensils. Each of us got an injera of our own to eat/use. FYI: they can give you more injera if you finish yours, but I suggest attacking the sauce-soaked one on the plate if you do finish yours. I’m glad I revisited Ethiopian cuisine after all these years. It was fun eating with your hands with a couple of close friends, and made for a good conversion centerpiece. The dorowot was cooked very well, and had a good slight kick of spice. The kifto was good too – the butter gave the tartare a smooth and warm texture. The veggie combination was a great suggestion by the servers, and it was fun trying to mix and match different ones with the proteins. I don’t think any of this strikes me as amazing food, as spoiled as I’ve been with dining out. But sometimes, simple and hearty ethnic food really hits the spot.